The railroad station at the corner of Washington and Norman Streets in Salem, around 1910. Image courtesy of the Library of Congress, Detroit Publishing Company Collection. Salem was a prosperous seaport throughout the 18th and early 19th centuries, with a fleet of sailing ships that brought goods to the city from around the world. 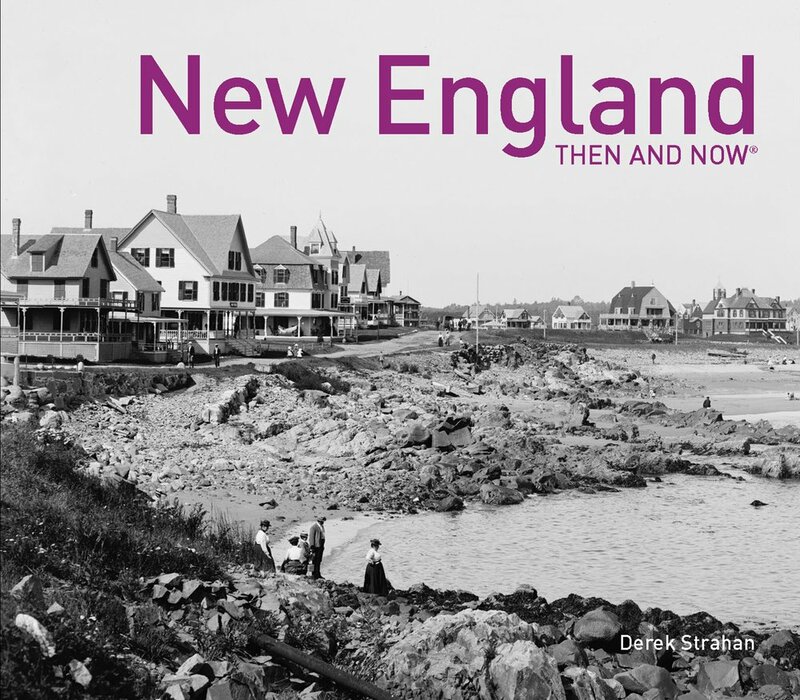 Given its location on the north shore of Massachusetts, it was heavily dependent on the sea for its commerce, but in 1838 the first railroad line was opened to Salem, connecting the city to East Boston by way of the 13-mile-long Eastern Railroad. The line initially ended here in Salem, at an earlier station on this site, but in 1839 it was extended north to Ipswich, and then to the New Hampshire state line the following year. In order to build it the old Court House, together with stores and other buildings standing south of Essex street, were demolished. Washington street was laid open throughout its entire length and a wide ditch was dug, much trouble being experienced from the sandy nature of the soil. Residents on the side of the street boarded up their house fronts and moved away for some weeks. The sidewalks were piled with gravel. A stone arch was built in the open ditch, and when this was finished the gravel was back-filled as far as possible and the surface restored. Three air holes surrounded with iron railings came up from the tunnel through the street for ventilation, but when the locomotives began to burn coal they were done away with. All this work was done on the most elaborate plans and models, it being considered one of the largest pieces of granite work ever undertaken up to that time in New England. The original railroad station was used until 1847, when it was replaced by the one in the 1910 photo. It was designed by prominent architect Gridley J. F. Bryant, with a castle-like appearance that included two large crenellated towers on the north side of the building, as seen here. Trains passed directly through the building, and under a granite arch between the towers that resembled a medieval city gate. The interior originally included three tracks, and the upper level of the station housed the offices for the Eastern Railroad, including those of the president and the superintendent. The station was badly damaged by an April 7, 1882 fire that started when a can of flares exploded in one of the baggage rooms. 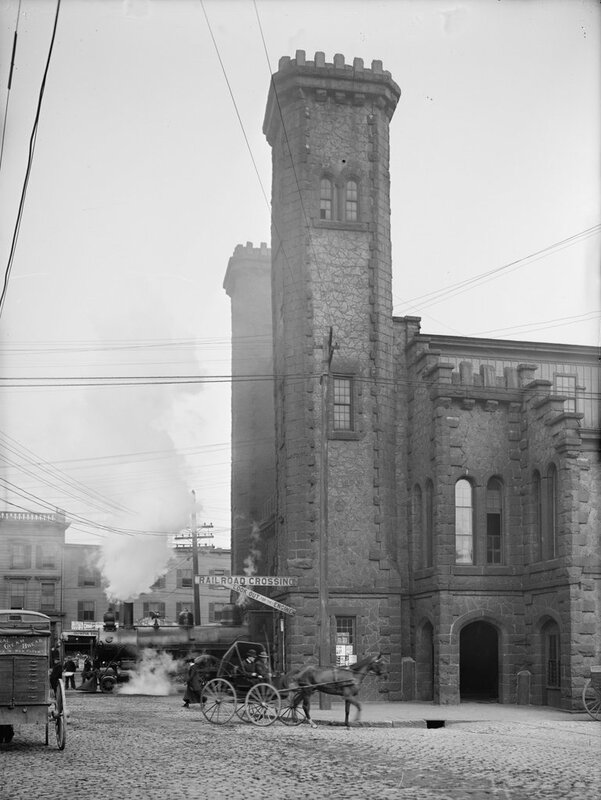 The wooded portions of the building were destroyed, but the granite exterior survived, and the rest of the station was soon rebuilt around it. Then, in 1884, the Eastern Railroad was acquired by its competitor, the Boston and Maine Railroad, and the station became part of a large railroad network that extended across northern New England. The first photo, taken around 1910, shows the a side view of the front of the building, with the original granite towers dominating the scene. In the lower left, a locomotive emerges from the station, while railroad flagmen – barely visible in front of the train – warn pedestrians and vehicles on the street. In 1914, much of the area immediately to the south of the station was destroyed in a catastrophic fire that burned over a thousand buildings. The station itself survived, though, and remained in use for more than a century after its completion. However, it was demolished in 1954 in order to extend the tunnel south to its current entrance at Mill Street. By this point, intercity passenger rail was in a serious decline, due to competition from automobiles and commercial airlines, and the replacement station was a much smaller building on Margin Street, just south of the new tunnel entrance. The 1950s station was used until 1987, when the present-day station was opened at the northern end of the tunnel, at the corner of Washington and Bridge Streets. Salem is no longer served by long-distance passenger trains, but it is now located on the MBTA Newburyport/Rockport commuter rail line, and trains still pass through the tunnel that runs underneath Washington Street. On the surface, though, there are no recognizable landmarks from the first photo, and today the scene is a busy intersection at the corner of Washington and Norman Streets. 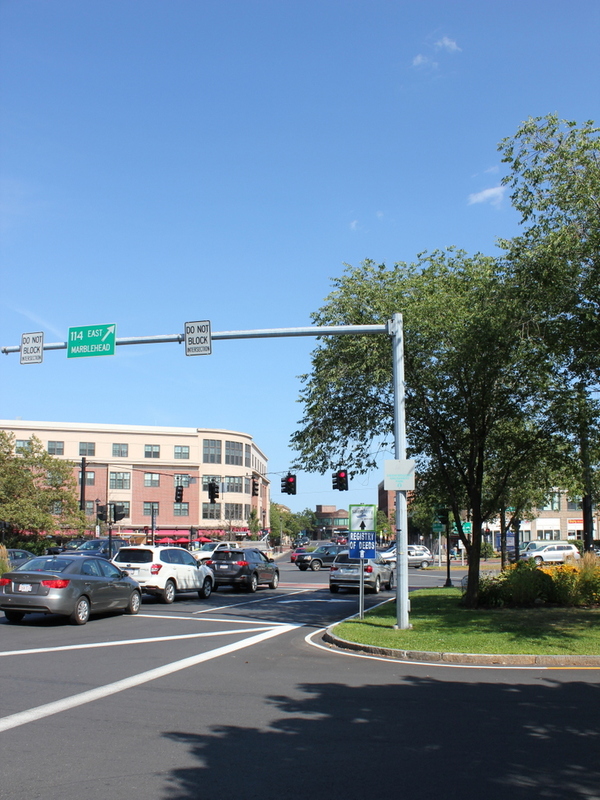 The former site of the historic station is now Riley Plaza, a small park that was dedicated in 1959 and named in honor of John P. Riley (1877-1950), a Salem resident who was awarded the Medal of Honor for his service in the Spanish-American War. The Essex Institute buildings at 132 and 134 Essex Street in Salem, around 1910-1920. Image courtesy of the Library of Congress, Detroit Publishing Company Collection. These two historic Italianate-style buildings were built a few years apart, and for different purposes, but later became home of the Essex Institute and were united into a single building. The older of the two sections, on the right side of the scene, was built in 1851-1852 as the home of merchant John Tucker Daland. It was designed by noted Boston architect Gridley J. F. Bryant, who would later go on to design the old Boston City Hall, and was among the finest homes of this period in Salem. Its square, three-story design echoed the style of earlier Salem mansions, such as the Gardner-Pingree House on the far right side of the photo, but featured Italianate details such as quoins on the corners, bracketed eaves, and arched windows on the third floor. 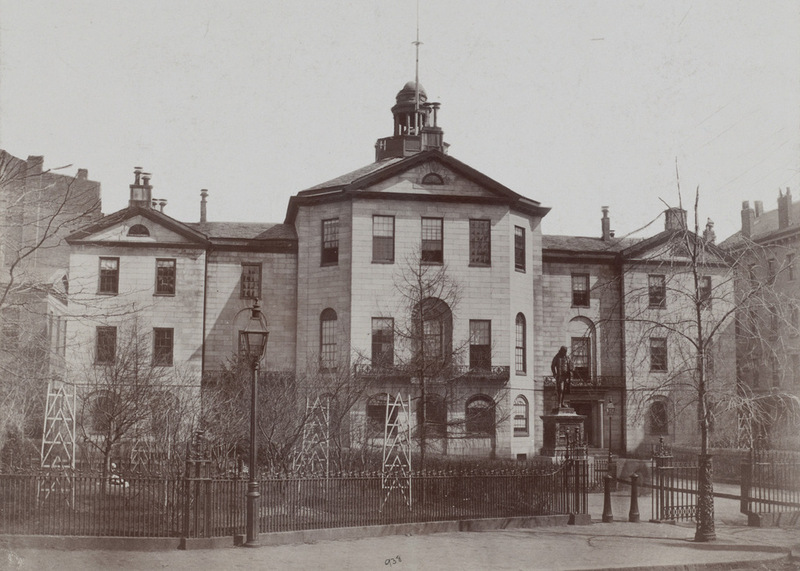 The building on the left side, Plummer Hall, was built only a few years later, in 1856-1857. It was the work of local architect Enoch Fuller, and included many of the same design features as its neighbor to the right. 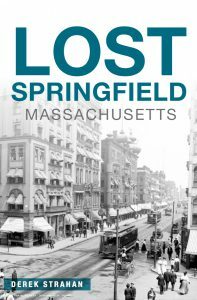 The building was originally owned by the Salem Athenaeum, a private library that was located in the large space on the upper floor. The lower floor was used by the Essex Institute, which had been established less than a decade earlier in 1848 with the merger of Essex Historical Society and the Essex County Natural History Society. The organization later shifted its focus to regional history, and over the years it accumulated a large collection of books, documents, and artwork, while also holding regular events such as lectures, concerts, and art exhibitions here in the building. John Tucker Daland died in 1858, and two years later his daughter Susan married physician Benjamin Cox, Jr. The couple lived here in this house, and had two children, Benjamin and Sarah. Dr. Cox was evidently a wealthy man, as shown by the family’s 1870 census listing, which values his real estate at $21,000 and his personal estate at $40,000, for a net worth that would be equivalent to about $1.2 million today. However, he died just a year later, at the age of 65, although the family continued to live here until 1885, when the house was transferred to the Essex Institute and converted into library and office space. 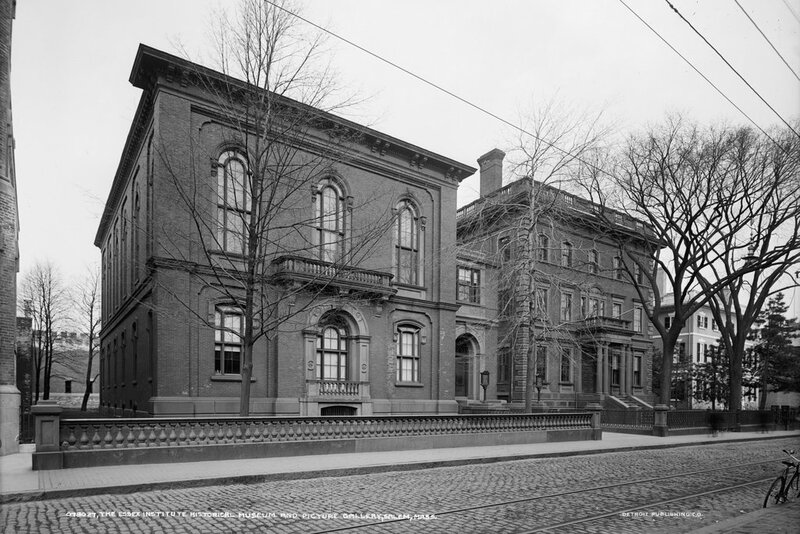 The Essex Institute also acquired ownership of Plummer Hall in 1906, when the Athenaeum relocated to a new building. A year later, the two buildings were joined by a small connector section, which can be seen a few years later in the first photo. The facility would be expanded several more times during the 20th century, including the addition of a five-story bookstack in the 1960s, but its exterior appearance from Essex Street has hardly changed since the first photo was taken. The only noticeable differences are the loss of the balustrades on the roof of the Daland House and on the porch of Plummer Hall, and the addition of a third story atop the connecter section. 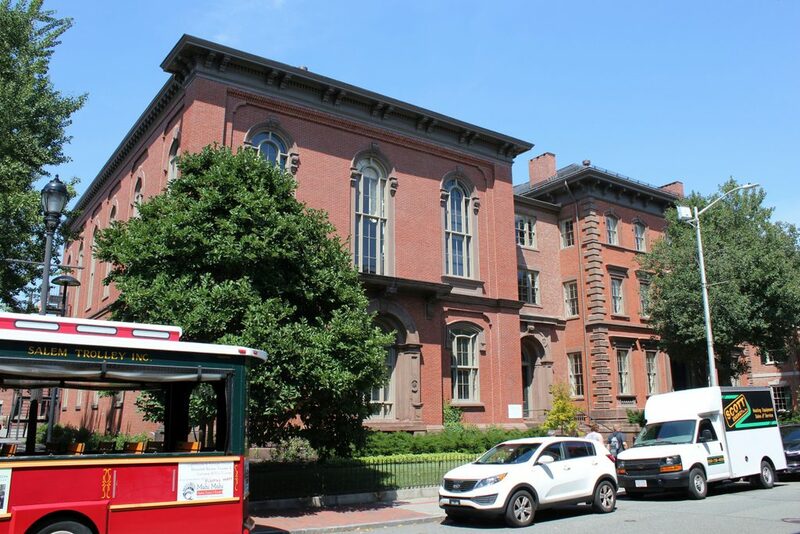 Today, the property is owned by the Peabody Essex Museum, which was formed in 1992 by the merger of the Essex Institute with the nearby Peabody Museum of Salem. The museum also owns a number of historic houses in the area, including the adjacent Gardner-Pingree House, the John Ward House on the other side of the building, and the Andrew-Safford House around the corner on Washington Square West. All of these buildings are now part of the Essex Institute Historic District, which was added to the National Register of Historic Places in 1972. Johnson Hall, which served as a courthouse and later as City Hall, on School Street around 1855-1862. Image courtesy of the Boston Public Library. Boston’s old City Hall, which replaced Johnson Hall, as seen in 1865. Image courtesy of the Boston Public Library. This site on School Street has had two different City Hall buildings, as seen in the photos above, but the history here goes back even further. From 1704 to 1748, Boston Latin School was located here, and during this time many of the Founding Fathers attended the school, including Benjamin Franklin, John Hancock, Samuel Adams, and Robert Treat Paine. 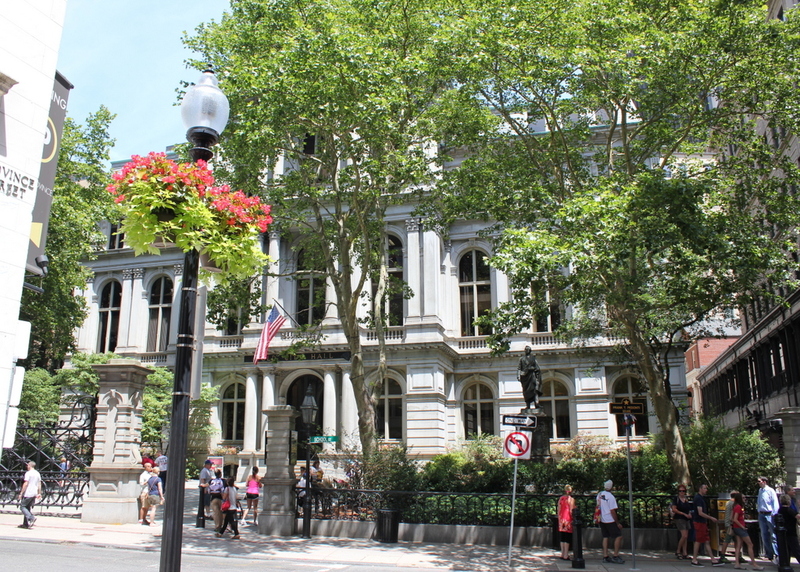 Years later, Charles Bulfinch designed a courthouse that was built here in 1810; this building, which is shown in the first photo, was used as both a county and federal courthouse in the early 19th century. 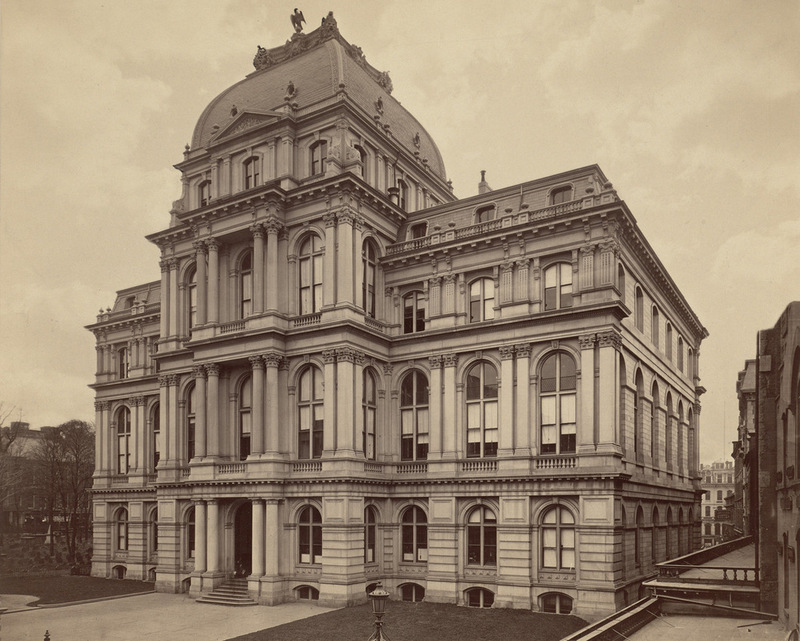 From 1841 until 1862, it was Boston’s City Hall, before being demolished and replaced with a newer, larger building. The new City Hall was completed in 1865, and was one of the first examples of Second Empire architecture in the United States. This French-inspired style would become very popular in the late 1860s and 1870s, especially in government buildings. Boston’s old post office, which was built a decade later and just a few blocks away, shares many similar features. On a much larger scale, the Old Executive Building next to the White House in Washington, DC also reflects the influence of Second Empire designs. During its time as City Hall, this building saw the rapid growth in the city during the late 1800s and early 1900s. When it was completed, the city had fewer than 200,000 people, but by the 1950s there were over 800,000, and the city government had long since outgrown this building. The City Hall Annex, located behind this building on Court Street, was built in 1912 to accommodate more offices, but by the 1960s the city was looking to build a new City Hall. The current building was completed in 1968, and since then the old building has been extensively renovated on the inside for commercial uses, but the exterior is essentially unchanged from 150 years ago.